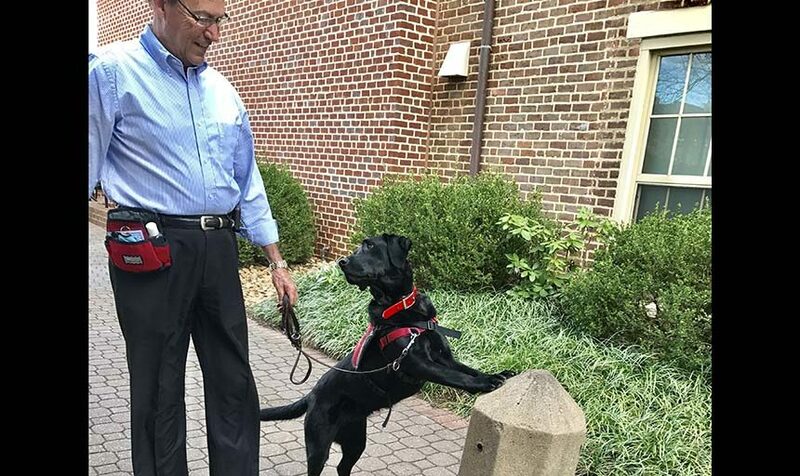 Current Status: Hero Dogs Graduate, partnered with Veteran Mike H.
Pi Lamda Phi Fraternity, in partnership with the Center for Leadership and Entrepreneurial Innovation, will host an evening of lessons in leadership from Mike Harris, a retired veteran and state police lieutenant. Harris served in the U.S. Air Force in the Vietnam War where he was assigned to a squadron flying the F-4 Phantom and then advanced to be a squadron commander of the Civil Air Patrol. After the Air Force, Harris was a Virginia State Police lieutenant and officer in charge of many units. On Sept. 11, he was given an assignment that led to the present day establishment of an anti-terrorism unit. Harris received numerous state police awards, including officer of the year in 1995. Upon retiring, Harris worked as a corporate pilot. He volunteers with The Wall That Heals, a mobile exhibit that is a replica of the Vietnam Veterans Memorial, with his service dog, Gracie. 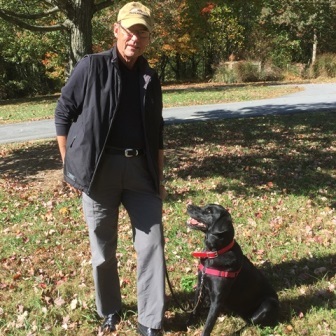 Gracie was trained by Hero Dogs, a non-profit that provides service dogs to veterans at no cost. Representatives from Hero Dogs will be at the event with a service dog in training. Hero Dogs Gracie is a very special dog - one of the best that we have had. For a long time, Gracie waited for an equally special someone who both needed and could appreciate her. Gracie has never been a typical Labrador who automatically loves the next person who walks in the room. While she is very affectionate with "her" people, Gracie takes time to bond to new people. Gracie also LOVES to work. She needed a partner who could meet her needs as well as she could meet theirs - her need to work, her need to have time to form a trusting bond, and her need to be their "one and only." Gracie found this partner in Vietnam Veteran Mike. Together, these two are tackling adventures Mike thought were lost to him forever. Who makes these partnerships possible? YOU do. Through your generosity and commitment, Hero Dogs is able to provide these amazing service dogs free of charge to our nation's heroes. As you know, Hero Dogs is engaged in the Veterans Charity Challenge 4, a fundraising competition with a $20,000 prize for the winning charity. You already helped us win the first week's challenge - and a $1,500 prize!! Are we up to the challenge again this week? The two charities which raise the most for their causes in the next week will bring home another $1,000 or $500!! And all the donations we receive help us toward our goal of winning the ultimate $20,000 prize at the end of the challenge - and providing another life-saving partner to another hero. Please donate today and change a life forever. P.S. Please share the link for this campaign on your Facebook page! Click here to read Gracie’s full blog.